Hindu mythology is full of powerful characters who serve as a code to communicate complex ideas. Bhisma is used to indicate a clingy but wise patriarch. Yudhishtira for an honest upright man. Shalya of the Mahabharata is another case in point, though not a very popular one. Searches for ‘Shalya’ on Google shot up dramatically after the Prime Minister Narendra Modi’s speech as he equated the pessimistic critics of his economic policies to Shalya, the archetypal demotivator, who perhaps fought the world’s first psychological warfare. Though accurate in description, the choice of this character in a national speech, is ironical, even unfortunate, for those familiar with the great epic, which to followers of Hindutva ideology, is an accurate historical record, of a war fought 5000 years ago on the bleak plains of Kurukshetra, in modern Haryana. Shalya was the king of Madra. His sister was Madri, the beautiful second wife of Pandu, and mother of Nakula and Sahadeva. When the Kauravas refused to part with Pandava land, and war was declared, the kings of India took sides. Eleven battalions fought on side of Kauravas, seven on side of Pandavas. Balarama refused to fight on either side. Rukmi was rejected by both sides. Krishna advised Pandavas but his army fought for the Kauravas. Shalya was supposed to fight for Pandavas, but was tricked by Duryodhana (who offered his troops food in exchange for a boon) into fighting for the Kauravas. He did not like it but he had given his word. Things got even worse when Duryodhana made him Karna’s charioteer. He, a king, was forced to serve as charioteer to the charioteer’s son (suta-putra). This was meant to please Karna who suffered from status anxiety, as well as humiliate the Pandavas who constantly insulted Karna for not knowing his place in the hierarchy. What could be worse for Pandavas than watching your royal uncle serving the man who you once insulted? 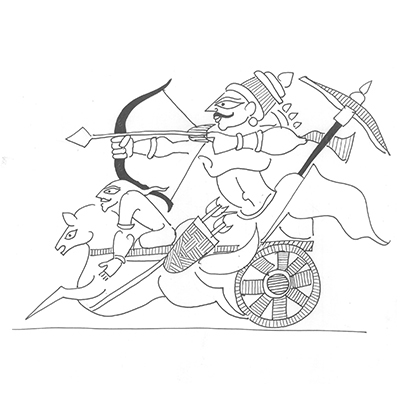 But this decision proved to be a fatal mistake, for when Karna’s chariot wheel got stuck in the mud Shalya argued as king he had never changed wheels, but surely as charioteer’s son Karna would know better, thus showing the sarathi (chariot-driver) turned rathi (chariot-rider) his place in the social hierarchy. After hearing the whole story, one wonders why did the Prime Minister call his critics Shalya. Yes, they demotivate him, but does he see himself as Karna, the meriotious outsider, one who was denied his rightful place by society? Or does he see his government as Kauravas who have tricked many economists into serving them? Are his opponents the entitled princes, or the ones who were cheated of their inheritance? Mythological examples are complex and need to be seen in context. Perhaps there are messages here that need deeper decoding. Shalya was the last commander of the Kauravas. In his watch, Duryodhan is finally killed. In a South-East retelling of the Mahabharata, the more you hate Shalya, the stronger he becomes. And so Krishna tells Yudhishtira to weaken him with love and affection, and finally impale him. Another lesson, here? The epic may not be myth to many, but it does mystify with its complex messages.